fabrics which are often seen in her illustrations have become something of a trademark for her. Maria alternates between illustrating and writing her own picture books and making the illustrations to other authors' texts. 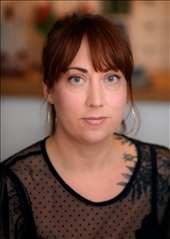 She has received several awards and nominations and in 2011 she was doubly nominated for her own picture book Petra's Spot and for Strange Animals together with Lotta Olsson. Cheeky and Scamp - So near yet so far?